When a member and/or spouse become Medicare eligible, it is very important that they contact Medicare to determine their enrollment needs. Failure to do so at that time could be very costly down the road. Once an OU Health member is retired or no longer working and on Medicare, you no longer have to be concerned about your provider/facility being a Blue Cross Blue Shield provider. Instead, you must be sure that any healthcare provider/facility you use accepts Medicare. Medicare becomes your primary medical coverage and OU Health becomes secondary (there are a few exceptions, please see the Plan Document for further information). OU Health will pay 80% of the balance after Medicare has paid. You will be responsible for paying the balance of 20% after you have met your annual deductible. However, do not pay any balance of a bill until you have received a bill from your healthcare provider/facility. OU Health provides a Medicare Part D wrap for prescription drug coverage that maintains your current benefits and copays. You will have a separate prescription drug card that you will use at your local pharmacy or mail order and specialty drug services. There may be instances when your prescription drug copay will be less than what your copay previously had been. Do not enroll in Medicare Part D! 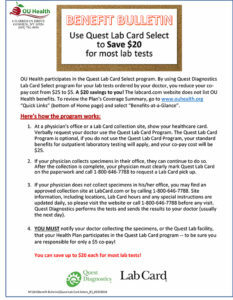 OU Health will do this for you automatically.